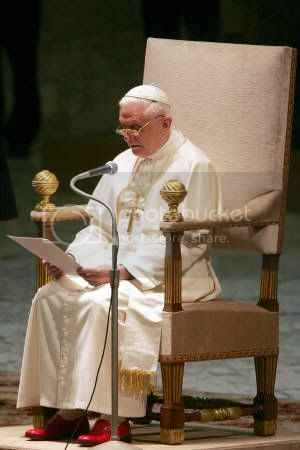 I have noticed that Benedict XVI IS wearing the red papal shoes. He has gone back to the tradition of wearing them. These shoes are also supplied by Gammarelli and are made of red leather. They have been worn by popes since the times of the Roman empire. Over the last few days, I have noticed that many people have been directed here with the search words ' popes red shoes' or 'popes shoes' or 'red shoes of the pope' or 'pope burial shoes' or 'why is the pope wearing brown shoes.' This made me wonder and realize that I needed to see what I could find out about red papal shoes verses the brown shoes he is buried in or rather laying in state in. I must say there was not much I could find easily about it. What I have found here is what I have read and read and been able to piece together. If anyone really knows the full history of the ' red shoes of the pope,' please leave me a comment here. Here is what I have found. It dates back to the 17th and 18th centuries when shoes were much more elaborate than what they are today. Back in the 17th century as Europe gained power and wealth, the elite distanced themselves from the masses through conspicuous refinement and extravagant ornamentation. A noble's status was visible in everything he or she did and wore. Artifice ruled the life of the elite. Flowery speech and mannered gestures characterized courtly accomplishment. 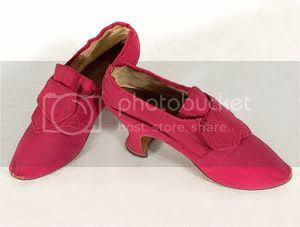 During the 18th century, red, silk faille shoes were all the rage. And I mean red! Shoes of this style were worn throughout Europe and were imported to the American colonies from England. 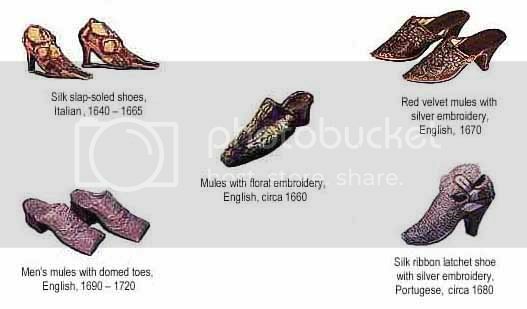 The dog-leg side seams, moderately high Louis heels, buckled latchets, and long vamp with square tongue are all features found in mid-18th century shoes. The style is simple, but what color! The shoes are fashioned from heavenly rose silk faille and are lined with ivory kid. Matching silk ribbon is used to bind the edges and cover the seams. The straight soles are leather. The latchets have marks that indicate where the buckles were attached. 18th century fashion was strongly influenced by the French Court. During the second part of the century the rigidity, dignity and seriousness of the womens dresses gave way to more flowing lines, decorated with bows and ruffles. Skirts were distended sideways by means of an under structure called a "panier" (basket). Shaped high heels were worn by men and women of the upper classes. 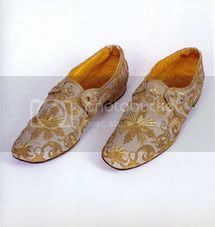 Materials for shoes and dresses were rich and splendid and included brocades, embroidered silks and painted leathers. Large showy buckles had become the feature of the shoes. After the French Revolution in 1792, shoe styles changed dramatically. Heels shrank and even disappeared, suggesting everyone was born on the same level. Expensive silks were largely replaced by more affordable and better-wearing leathers. Now it is my thought that the high officials of the church also wore elaborate shoes as well. The wealth of the church was visible in the elaborate robes the pope and other church officials wore. The wealth of the church is symbolized by items such as an 1871 papal tiara of Pope Pius IX, designed by Jean Baptiste Bethune and made from gold, gilt silver, enamel and precious stones. Gothically inspired, this three-tiered headpiece has numerous crosses of colorful jewels encircling each level and is topped with another cross. As evidenced by a pair of 20th-century papal slippers worn by Pope Paul VI, made of red satin, silk, gold thread and leather, the popes through the centuries have been beautifully outfitted, literally from head to toe. There was an art exhibit being show some time ago called Saint Peter and The Vatican : The Legacy of the Popes. It really shows how rich the church was and what wealth it exhibited from fixtures to attire. A blockbuster in terms of size and quality of objects, this exhibition boasts an embarrassment of riches. An upstairs gallery in the dramatically reconfigured museum space houses a number of the embroidered robes and miters worn by various popes over the centuries. Attendant religious paraphernalia includes an 1887 monstrance, or receptacle for the consecrated wafer, used by Pope Leo XIII. Made by Istvan Fulop Wink of Budapest from silver and enamel, this is a towering work of gothic spires. Its devotional imagery, including a tiny statue of the Virgin Mary carrying the baby Jesus, reflects Christianity in Hungary since the 11th century. Most of the show's more than 350 pieces had never before been shown to the public. The treasures include papal tiaras tall as wedding cakes, marble statues, crosses, frescoes, chalices, illuminated manuscripts, drawings by Michelangelo and papal clothing. Also on view are drawings and architectural models of Saint Peter'sBasilica, a replica of the monument that marks this first pope's burial site and rare religious relics, such as the finger of Pope Pius V from the 16th century. From the exhibit, here are the Papal Shoes of Bessed John XXIII. 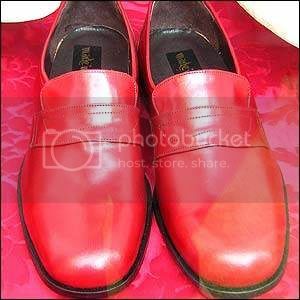 Part of the traditional rituals that take place when a pope dies is to dress him in red shoes. Vatican officials officially notify heads of state around the world of the pope's death and summon the College of Cardinals to Rome by telegram. Customarily, it is a terse message. The telegram that cardinals received after the death of Pope Paul VI simply stated: "Pope is dead. Come at once." The pope's confessors dress him in his funeral garments: a white cassock, a scarlet chasuble (a long, sleeveless liturgical vestment) and red silk shoes, and then take the first watch at vigil. 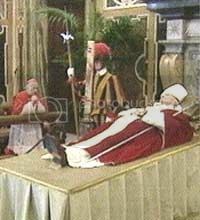 The pope then lies in state for three days, first in the Clementine Hall of the Apostolic Palace, and then is taken in solemn procession to St. Peter's Basilica, where the faithful file past his body as Vatican guards urge them on with cries of "Avanti! " Traditionally, the funeral takes place on the fourth day after a pope's death. John Paul II does not have on red shoes. He is wearing brown shoes. One news article I read said that he normally wore brown shoes everyday. Maybe that is what he decided he would like to be buried in, instead of the red papal shoes. A news story I heard today said that he had purposely decided to give up the red papal shoes for the brown ones and that is why he always wore then...because he came from humble beginnings and the brown shoes were more in keeping with that. The shoes he has on now were actually a christmas gift from a close friend of his and they are a size 44 in Europoean sizes. He is an american 10.5 in mens shoes. The pope, his face serene, is dressed in red and white vestments and a white mitre. He is laid out on a raised velvet-draped dais flanked by two Swiss Guards in the Clementine Room on the third floor of the Apostolic Palace. A crucifix, crooked in an elbow, flanks his body to the left. His head, propped on velvet pillows, leans slightly to the right. On his feet are brown leather shoes. Why the change? Well after searching and searching, I found the following document with changes and updates to the robes worn by all. Red shoes are mentioned and are actually discouraged. Maybe John Paul II was following these new updates for wardrobe when it comes to shoes. Look at #10 under Cardinals. It specifically address the wearing of red shoes. Info below found at The Cardinals of the Holy Roman Church. 35. Concerning the dress and titles of canons, holders of benefices and parish priests, suitable norms will be issued by the Sacred Congregation for the Clergy, following the criteria of simplification contained in the present document. Well, that is it...all that I could piece together about the pope's red burial shoes. Wow, you've really done the research here! I wasn't even aware of the pope's red shoe thing before, but it's interesting to know that now the red shoes and even buckles are verboten! I have had many pairs of red shoes that I really love wearing. Since I'm not a pope, cardinal, or bishop, I guess it's ok if I'm buried in my red shoes. I may not be "well-heeled" in the sense of being wealthy, but I always like to be well-shod in my shoes! I am with you MB about being well shod. I just wish Ihad more red shoes. I only have 1 pair and they are flats I wear in the summer. I have none for dressy occasions. Hi--I was convinced I saw the pope wearing red shoes on TV while lying in state so did some research as well. I looked at all the pictures I could find on the Internet and my conclusion is he wore brown shoes at first and then they were changed to red shoes at some point. I guess they followed his request at first but then just thought the brown shoes weren't good enough. The red shoes I saw on TV were beautiful. Hi again--I forgot to say I also found a story written by a Canadian woman who went to view the pope who clearly stated he had on "cherry" colored shoes. This again reinforces the theory that his shoes were changed from the simple brown ones to the fancier red ones somewhere along the line. terry it could be that for the burial they stuck with the tradition of the red ahoes for burial as indicated in the section I posted about the burial procedures. I know he wore the brown everyday and while lying in state. For the burial they must have changed them to the red. I did try to find additional pictures of the shoes at burial but did not come across any when I went looking. Thanks for coming by! i have to do a report for school on something that has to do with the Catholic church every week and i was running out of ideas but then i found your site and it saved me! i just wanted to thank you. anni..i am glad that you were able to find something useful to you here! glad i could help! please come again any time! I have been wondering about the shoes since seeing all the popes in St. Peters dressed in them. Thanks! I found a lying-in-state Photo of Pope St. Pius X (Joseph Sarto, the only other pope besides the present one whose real name was Joseph.) and he looks like he's wearinbg some kind of striped and checkered shoes! Think he hated wearing shoes in general. Does anyone know the shoe size for Benedict XVI? Hi, that the pope traditionally wears red shoes is as old as the Roman Empire of Julius Caesar, Augustus, etc. Patricians and senators wore red shoes during those times. Caesar wore red shoes. By the time of the toleration of Christianity, the bishop of Rome, being of high dignity was afforded that honor and continued the custom of wearing red shoes. The matter of the red shoes was also one of the sticking points between the Pope and the Patriarch of Constantinople since the Pope had always worn red shoes but the Patriarch was not allowed to wear red shoes. So the matter of the pope wearing red shoes is a custom that has its origins that can be traced as far back as the Roman Republic or maybe even earlier. I think that the information posted here is very interesting. However, it seems that they have been reformed by Pope Benedict XVI, because after his election bishops began changing their coat or arms introducing the Mitre and other elements in them. I do not share the view that by changing the exterior traditions of the Papacy it makes it closer to the people. Actually Pope John XXIII, who is champion of anti-traditionalist, was the last Pope who gladly wore all the exterior elements of the Pope (Triple Tiara, red shoes, "although those were much nicer than today's ugly red shoes", Sedia Gestatoria, etc), and he was greatly beloved. Now we see that clerics are leaving the cassock for the clerical suit. I don't agree with this. Modesty and meekness is a virtue of the soul that transpires to exterior, while today many clerics wish to go unnoticed but it can hardly be said that they are really humble and meek, quite the contrary. When modesty and meekness become mixed with secular ideology, everything is lost. Who care what colour of shos or any thing else the Pope wares. stands at the judgement seat of Christ. The Patricians of Ancient Rome -- the families from which the first pontiffs came --wore red shoes as a symbol of the class they belonged to. It's a tribal thing. Patricians wore red shoes. PS: I hope that sheds light on why a humple Polish Pope would choose brown shoes. And why others would choose red. I happened upon this blog topic and, for what it is worth, here is what I was told (long ago - while a seminary student). The significance of the color red (with respect to the Pope's shoes) comes from reference "Shoes of a Fisherman". In delegating St. Peter as "the first Pope", as it were, Jesus used the phrase "I will make you a fisher of men". Fishing was a big "industry" in that region (and at that time). Fishermen could be easily identified by the fact that their shoes (sandles then, I suppose) were stained red from the blood of the fish they were catching/preparing. Wearing "the Fisherman's shoes" is often a reference to the Pope. Ergo, the significance of the color red for the Pope's shoes. Right or wrong, that's what I was taught. The true is that, in tradition the Pope wore red shoes, but that is not an official dress code for the papal office, unlike the white skull cap(zucchetto) is. When John Paul II took office he preferred to wear the brown working shoes that he found confortable and also was and indication of his constant work by traveling to do God's work. Like John Paul one who refused a tiarra and change the coronation ceromony to a installation mass. 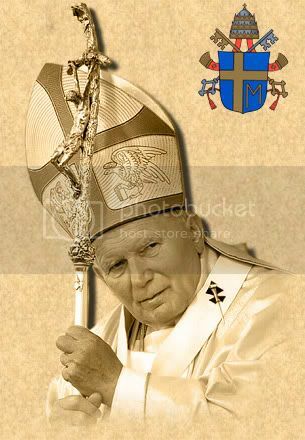 John Paul II, also took a humble aproach to the papacy and wasn't interested in the vestments and other elborate items. He considered himself a "shephard" and therefore preferred to wear simple working/walking shoes. hey guys..why should u wonder about the red shoes whn u dont even know the secret behind them and who the pope is himself.if u want to know the truth about the pope and his secrets in regard to the end times them surf about the secrets of the pope and u ll find out that he is a muderer!!!!!!! !The anti-christ..AND THE TRUTH HURTS BUT FIND OUT FOR THE GOOD OF YOUR SOUL.....ON JUDGEMENT DAY.DONT FALL A CULPRIT OF HIS CULT "catholicism"
the families from which the first pontiffs came --wore red shoes as a symbol of the class they belonged to. It's a tribal thing. I could find on the Internet and my conclusion is he wore brown shoes at first and then they were changed to red shoes at some point. (the millions of real Bible-believing Christians the Roman Catholic Church murdered in the Inquisitions). The Cardinals wear red to symbolize the blood they are willing to spill in defense the the RC church.